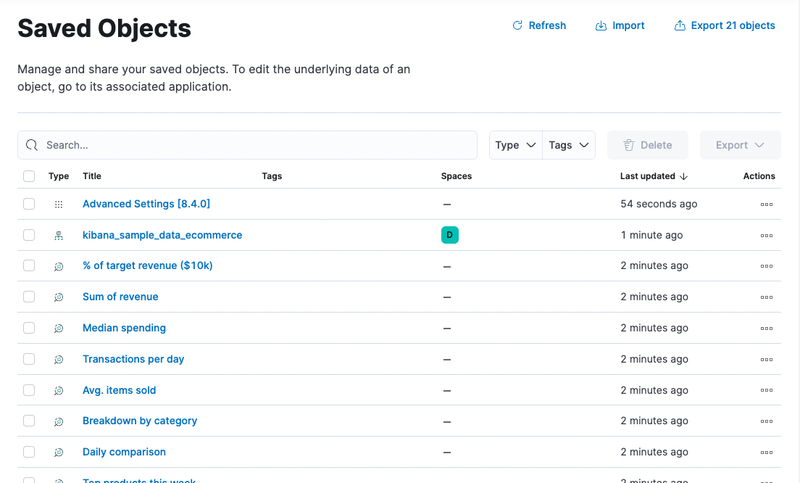 You can view, edit, delete, import, and export saved objects from Management > Saved Objects. A saved object can be a search, visualization, dashboard, or index pattern. To narrow the list of saved objects, enter a search term or select an object type. In app opens the object in its associated application so you can view and edit it. Relationships shows other objects that use this object so you know the impact of deleting it. To delete a saved object, select its checkbox and click Delete. Saved Objects offers an advanced Edit page for modifying the object definition. To open the page, click the object name in the list of objects. You can change the object title, add a description, and modify the JSON that defines the object properties. Recreate the index so you can continue using the object. Delete the object and recreate it using a different index. Change the index name referenced in the object’s kibanaSavedObjectMeta.searchSourceJSON to point to an existing index pattern. This is useful if the index you were working with has been renamed. Validation is not performed for object properties. Submitting an invalid change will render the object unusable. A more failsafe approach is to use the Discover, Visualize, or Dashboard pages to create new objects instead of directly editing an existing one. You might have multiple environments for development and production. The export and import commands allow you to move objects between different Kibana instances. You have a large number of objects to update and want to batch this process. You can export the objects to JSON, make the JSON modification, and re-import the objects. Select the object types you want to export. Exported dashboards do not include their associated index patterns. Re-create the index patterns manually before importing saved dashboards to a Kibana instance running on another Elasticsearch cluster. Navigate to the JSON file that represents the objects to import. Indicate whether to overwrite objects already in Kibana.